Greek wedding bombonieres handmade with two white tulles, tied with a lilac satin ribbon and decorated with gold color olive leaves. They are also available in many colors upon request and contain 7 koufeta sugar coated almonds. Height 25 cm (approximately 9.84' inches). 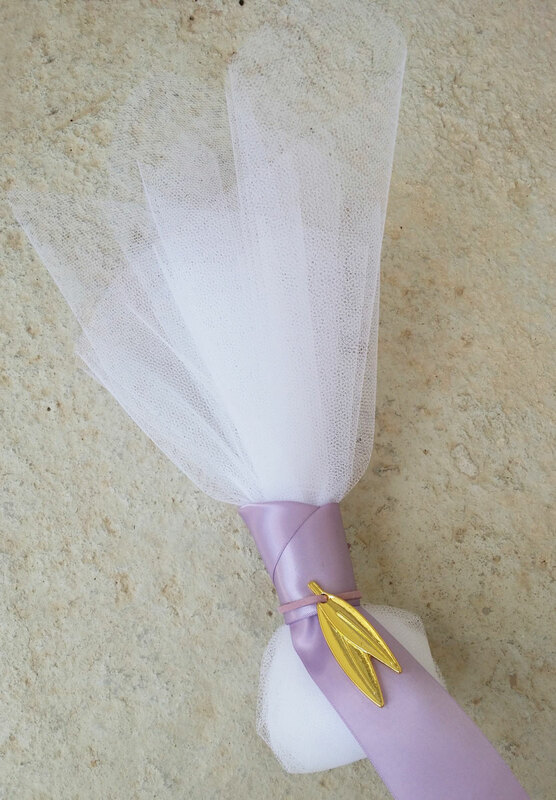 https://www.preciousandpretty.com/2018/12/wedding-bombonieres-with-lilac-ribbon-and-olive-charm-g115.html Greek Wedding Favors|Orthodox Crowns|Stefana|Baptism Invitations Wedding bombonieres with lilac ribbon and olive charm G115 Wedding bombonieres with lilac ribbon and olive charm Product #: Greek Wedding Favors|Orthodox Crowns|Stefana|Baptism Invitations_7433528941355757897 5 stars out of 5 reviews.